Well this is a heartwarming tale, although quite sad as well. We hear and see so many stories about how nasty humans can be sometimes, so it’s always nice to come across stories where the opposite is also true. The video doesn’t need much in the way of explanation, as title above says it all. Apart from the apparent kindness of the humans, it’s amazing to see a fox asking for help in this way, even when its life is obviously in danger. It’s not like humans have been especially kind to foxes over the past centuries, hunting them for sport and such like. And the cause of the fox’s distress is of course human activity in the area. 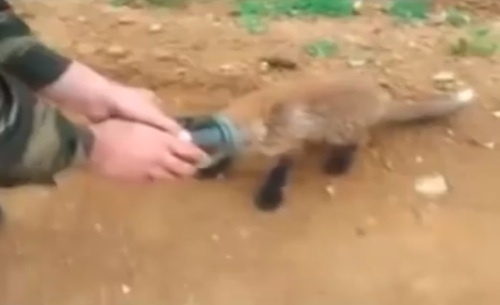 Although the video seems like a strange occurrence, many animals in the wild suffer from these kinds of incidents; fortunately, this little fox with a jar stuck on its head lived to tell the tale.